English Rose Tunnel or Walkway in Wrought iron. 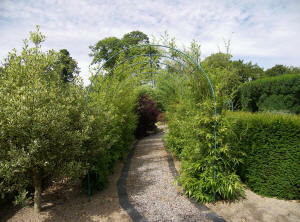 The Tunnel shown here is formed by joining three 4 ft Opening with 2 English Rose Arch Joining Kits. The arches are spaced at 36"/91cms intervals and are connected with 2 English Rose Arch Joining Kits. Each joining kit consists of 3 joining rods. The price including VAT for Black, Green or Natural Rusted £603. For White, Cream, Unpainted Galvanised or Etch Galvanised the price is £715. And for Hand Painted Verdigris the price is £788. The arches are joined with one English Rose Arch Joining Kit consisting of 3 rods which separate the arches by 3 ft/91cm. The price including VAT for Black, Green or Natural Rusted £394. For White, Cream, Unpainted Galvanised or Etch Galvanised the price is £482. The dimensions of a tunnel formed with two English Rose Arches are 4ft/122cm Opening x 6ft/183cm Long x 7ft 6" /229cm High. 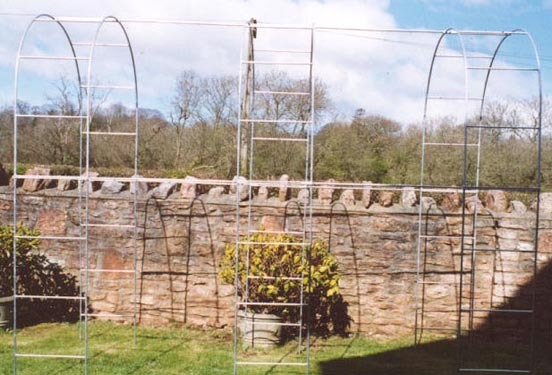 The arches are joined with one English Rose Arch Joining Kit consisting of 3 rods which separate the arches by 3 ft/91cm. This is a second picture of the tunnel. 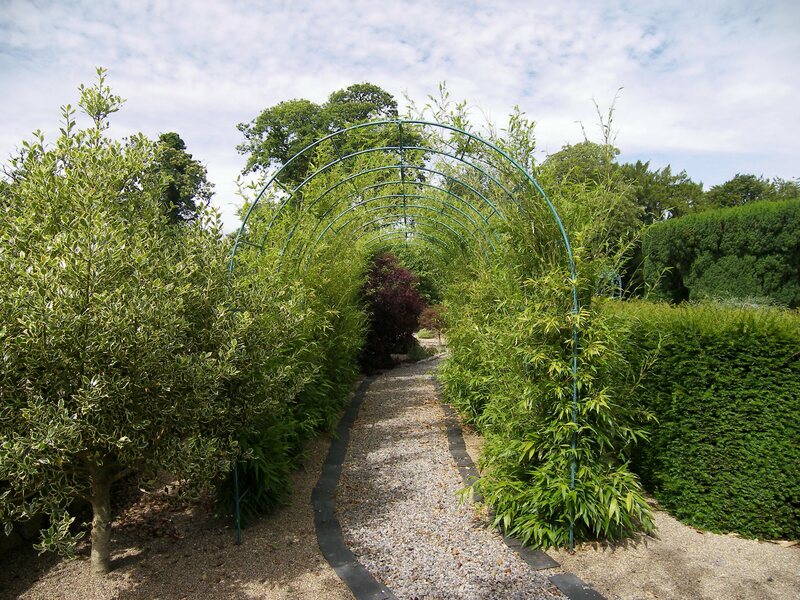 Our customer with this Tunnel wanted to space the arches with varying distances between each other to line up with the shrubs and plants already in position. Height above the ground:7ft 6ins/229cm after pushing the legs into the ground. The price of these Tunnels in Black, Green or Natural Rusted is £875. In White, Cream, Unpainted Galvanised, or Etch Galvanised the price is £985. 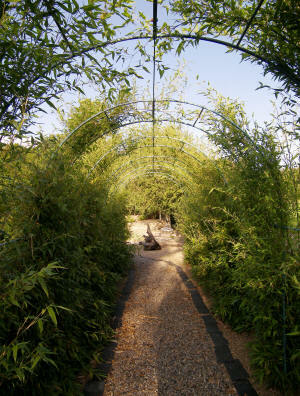 The English Rose Tunnel can be extended as far as is required by adding more Arches, each with a Joining Kit. Each extra arch and joining kit increases the length of a Tunnel by 4ft 6" or 137cm. (18" for the depth of the arch and 36" for the joining kit making a total of 54"/137cm). White, Cream, Etched Galvanised or Unpainted Galvanised. £263. Natural Rusted Galvanised, Cream or White Verdigris White. The height of the arches is 7 ft 6" after being pushed 12" or 31cm into the ground. We can work out the price of other lengths of Tunnel for you - please contact us at Wessex Forge - see below. We can make special lengths of the joining kit rods so that a Tunnel can fit exactly into an available space. or at Wessex Forge Unit 5, Lodge Hill Ind Estate, Westbury, Wells BA5 1EY. There is a delivery charge based on the order value. - See "How to Order" on Home Page. On orders over £500 (including VAT) the delivery charge is £46 to most parts of mainland UK.